But please act fast — because we recently sold out of these delicious, easy-to-prepare Survival Food Kits. And it won’t take much for us to sell out again. When we launched our first big survival food sale… we expected customers to stock up with a week or a month’s worth of food. But they couldn’t get enough! And just like that… the 3-Month Kit became our best seller. We blew through 1,932 of them in less than four days. That’s over 1 million servings of food! Obviously we were thrilled (and so were our customers). At least… the ones who claimed their kits in time. But our inventory manager was frowning. Oh no. She was right. There was no time to lose. We had to find a way to get more survival food into the hands of more Americans. And fast! Especially since every batch of 4Patriots Survival Food is made from scratch — and each kit is packed by hand. Meaning that it could take months to build up enough “safety stock” for another big sale. We got right to work. Added a night shift at the warehouse and put in overtime to catch up. Our inventory manager nearly gave herself an ulcer trying make all that food. Today you can claim your own 3-Month Survival Food Kit. Each one is rated for 25 years on the shelf. 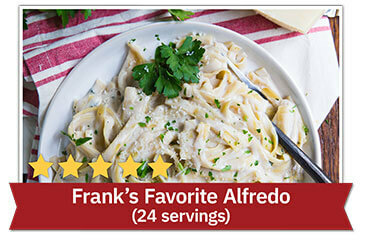 It’s packed with delicious family-favorite recipes you’ll be proud to serve. 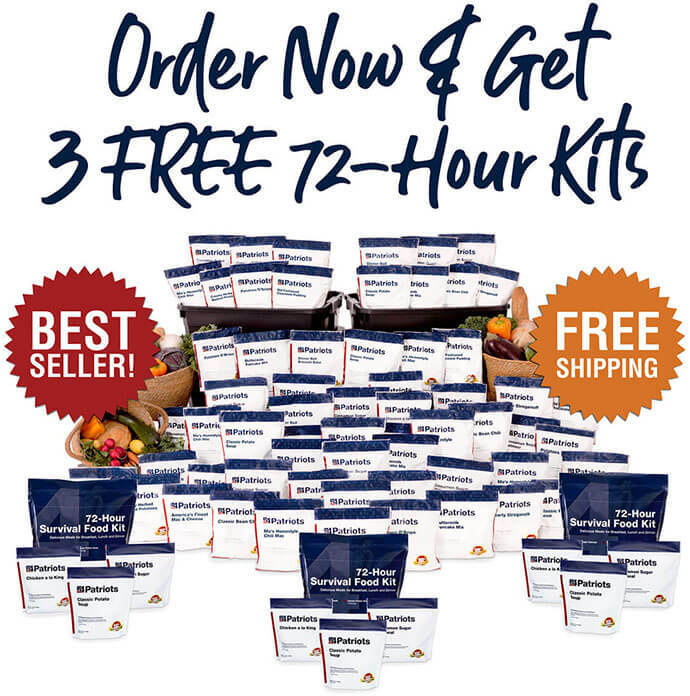 You get 3 FREE 72-Hour Kits with your purchase today. That’s $125.85 worth of high-quality survival food, yours FREE! Because we feel terrible about selling out! Anyone taking steps to provide for themselves and their family in a crisis deserves to be commended… not made to wait! So if you’re one of the self-reliant few… rewarding you with a few FREE kits is the least we can do. 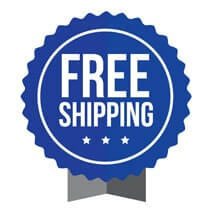 When word gets out about these FREE kits—plus the FREE Shipping and other FREE gifts I’ll tell you about below—there’ll be a mad rush on this deal. And I have no doubt that we’ll sell out again, just like we have before. The 3-Month Kit is a great value. Incredible variety & delicious for the long haul. So you’ll be ready for when a challenge comes… be that tomorrow or 25 years from now. Delicious, nutritious, good-for-25-years, and there to back you up in an emergency. Most importantly… with proper storage it can hold up for decades! Every 3-Month Kit is packed with the best-tasting meals for breakfast, lunch, and dinner. Your family will love eating this food. Just like our families do! And the packaging is designed for your ultimate convenience. Fresh fruits and veggies are the starting point for your 3-Month Survival Food kit. When we make your food, we use foods in the “fresh produce” category. Picture the delicious veggies you find at your local farmer’s market. And what’s not in your kit? There’s no MSG, no harmful chemicals and NO foreign Frankenfillers. Just real, delicious food! 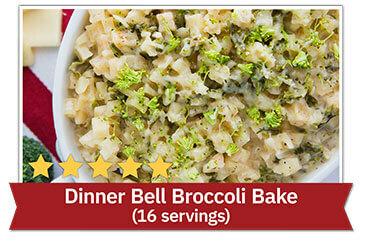 Next, we combine our top-quality ingredients using prize-winning recipes. 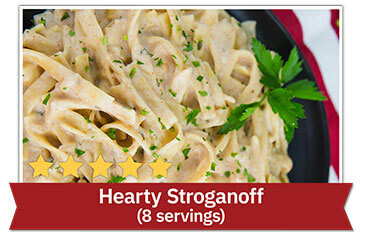 In fact, many of our recipes have won independent taste tests. You don’t have to save your kit for emergencies. The food is so good… you’ll actually ENJOY eating it. Use it to stretch your grocery budget. Or just save yourself a trip to the store! 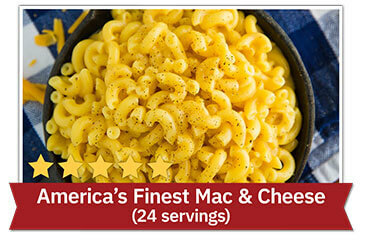 Delicious... good for 25 years… and backed by 5,300+ positive customer reviews. Tastes Homemade – Because it Is! Your food is made in America — packed at a family-owned facility in Utah. And the hard-working folks that make your food are experts in their field… nutritionists, chefs, engineers, packers and quality control inspectors. Our facility holds numerous FDA, USDA and SQF certifications. All to protect the quality of your food. Your meals are made with our unique "low-heat dehydration method." This is a much slower and more painstaking technique than traditional freeze-drying or rapid dehydration. 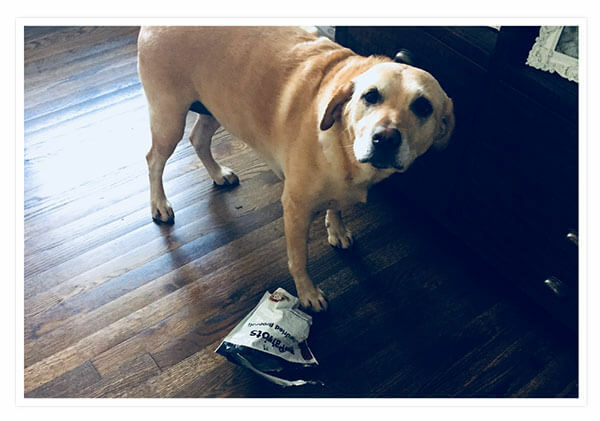 But it’s worth it because the flavor and nutrition stay locked in, and the food lasts every bit as long as freeze dried… without costing you a fortune. Top-of-the-line Mylar pouches – the same material used in NASA's space suits – keep the air, moisture, and light OUT so your food stays fresh. This is military-grade sturdy stuff that can stand up to the crazy things that happen in an emergency. You get tremendous peace of mind and you don’t have to worry about your food spoiling. A Cinch to Make — Easy as 1, 2… 3! Your 3-Month Kit is packed with real family-favorite recipes you can prepare in just 3 simple steps. Simply add boiling water, simmer and serve. It takes about 15 minutes from start to finish. Even your kids or grandkids can make them, easy as pie. Just look at how easy it is! 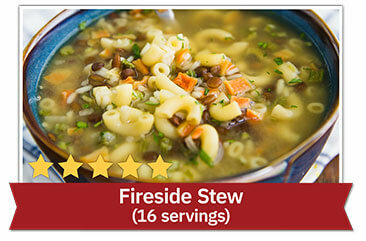 “Trust me — after eating more than my share of MRE’s while in the military — 4Patriots Survival Food is like a 5-star meal. And with so many choices, you will not get tired of eating the same ole thing. “This is really easy to make. Just open the pouch, combine your food with boiling water, and simmer — it’s so fast! The flavor and aroma are fantastic. My husband is a logger and he comes home quite hungry after a long day. The portions fill him up and he likes the food. He cleans his plate! Nobody wants to cram their house full of clunky food packages. That’s why your 3-Month Kit is compact. It comes in two water-resistant, stackable totes with easy-carry handles. That means less worry about air, water or critters getting at your survival food before you’re ready to enjoy it. Or take them with you on the road. No matter where you keep your kits, you can store them discreetly and without hassle. No one will know you have a stash of high-quality survival food… except you. Most folks who have gotten a 3-Month Kit are delighted with the long-term packaging, the delicious flavor and how easy it is to store them. "What Kind of Food Will I Get to Eat?" Now, I know what you’re worried about here… maybe you’re imagining bland, tasteless mush. 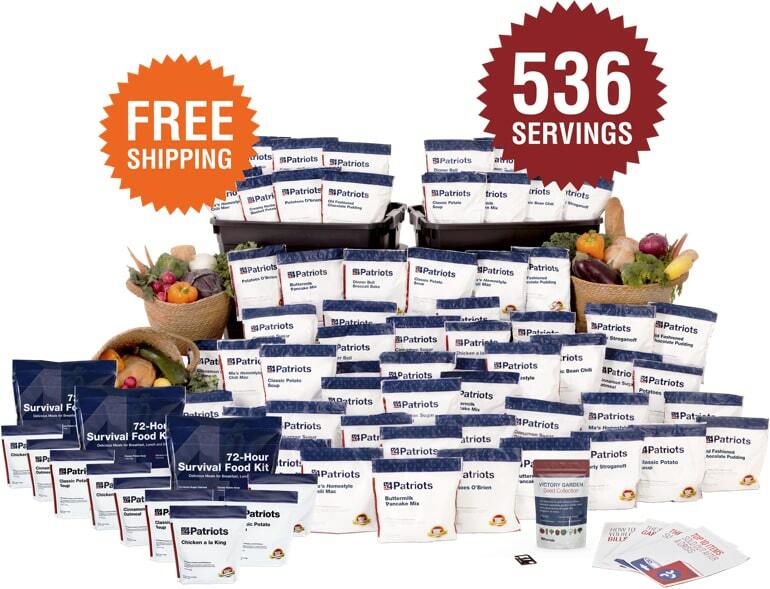 You'll get 536 servings of delicious and nutritious survival food rated for 25 years of storage… that’s about 6 servings a day for breakfast, lunch and dinner! Each kit has 98,160 total calories (1,091 calories per day) for energy and nutrients to survive a stressful emergency situation. So you don't get stuck eating the same thing day in and day out. Grandma was right… breakfast is the most important meal of the day. And whether you’re on your way to work or find yourself in an emergency situation, we’ve got you covered! 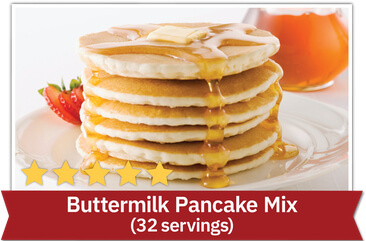 Make a tall stack of our fluffy Buttermilk Pancakes, slather on some fresh butter and maple syrup, and you’ve got feast the whole family will love. 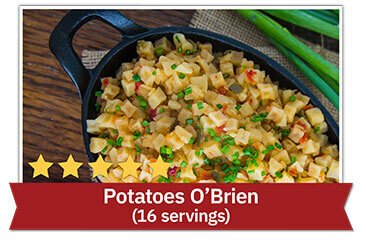 How about pairing it with a side of tempting Potatoes O’Brien? Or, there’s nothing quite like a warm and comforting bowl of Cinnamon Sugar Oatmeal – a breakfast to fill you up with just the right hint of sweetness to start your day off right. Maybe you’re more of a straight-up cereal kind of person. 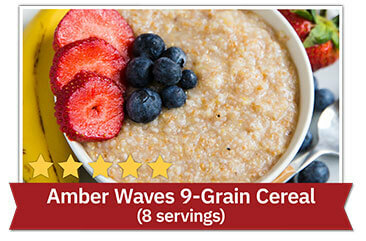 We’ve got just the thing for you with our Amber Waves 9 Grain Cereal – full of healthy fiber (five whole grams per serving!) 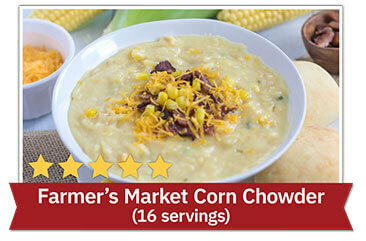 to help keep you “regular” and the tasty goodness of whole grains. 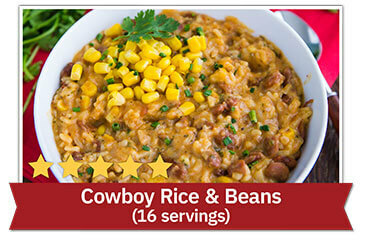 Next, we are really going to rev-up your taste buds! 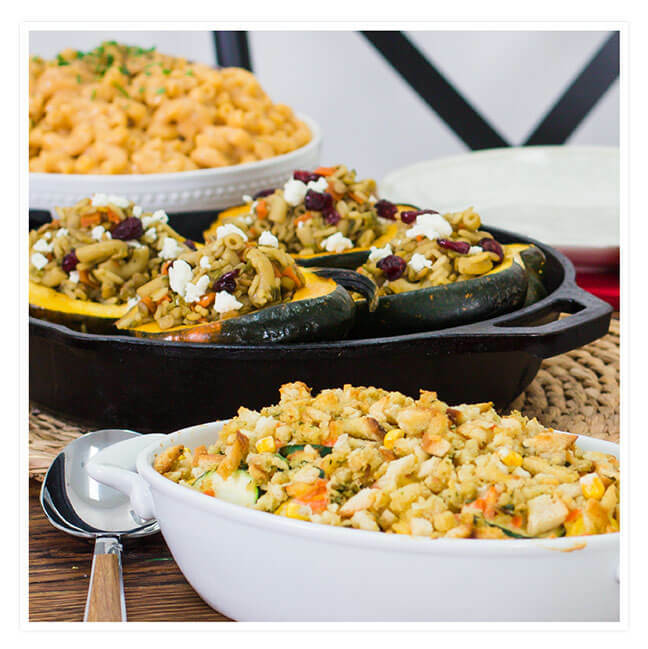 Hold on to your palate because we’ve got main courses that will have the whole family clamoring for seconds. 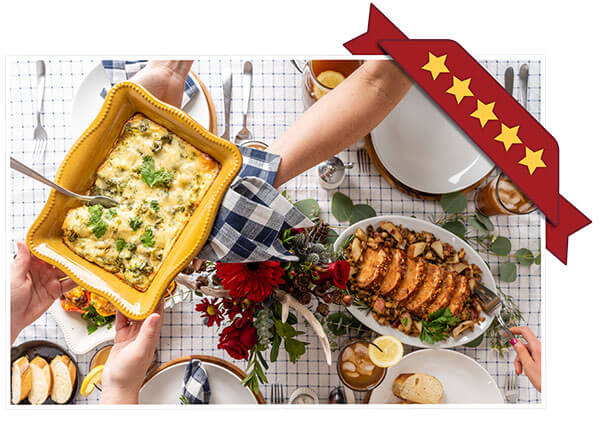 When you see the kind of dishes you get in this kit – all-stars like Chicken ala King, Hearty Stroganoff, or Fireside Stew – you might think you’re reading the menu from your favorite family restaurant! 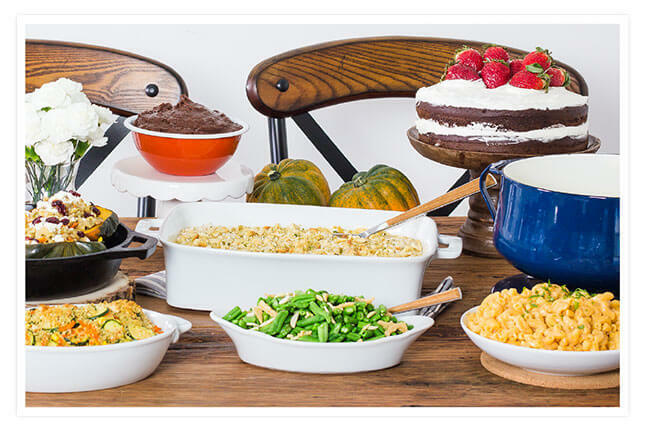 No one in your crew will ever be bored with this collection of comfort food favorites! Forget boring canned goods or “survival grub in a bucket.” Even your pickiest eaters will devour each of these lunch and dinner entrées with gusto! This is because we make all our food with care and attention down to the last detail. We add just the right pinch of herbs and spices to make each serving taste like a homemade meal. And, we feature real ingredients and preservation methods to seal in all that good flavor and nutrition. 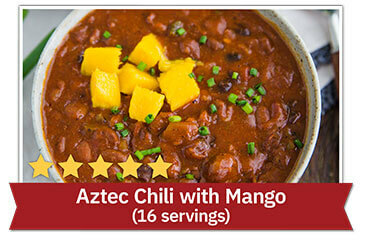 Some of our newest “survival food superstars” are recipes like: the bold and flavorful Aztec Chili with Mango, the ooey-gooey melty deliciousness of America’s Finest Mac & Cheese, and the memory-making Dinner Bell Broccoli Bake that will harken back to your Mom’s best casseroles. Yum! Now you might be thinking, “the main meals sound amazing, but what about the perfect additions to go with them?” We’re glad you asked! We all crave a delectable dessert or satisfying snack. Sometimes, it’s the side dish that makes the best part of an already delicious meal. Either way, with this assortment, you’ll never leave hungry! 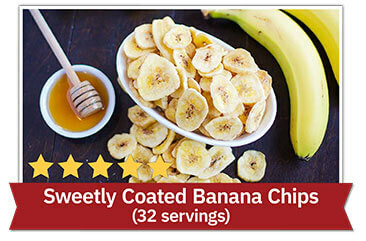 If you love fruit and still want to entertain your sweet tooth, you’ll simply love our Sweetly Coated Banana Chips. Need something slightly more decadent? 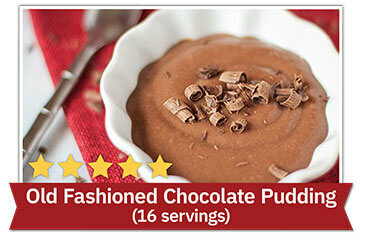 Then our Old Fashioned Chocolate Pudding is exactly what you’ll want to try. Remember the aroma of homemade chocolate pudding as it cooked on your Grandma’s stove on a crisp autumn day? That same silken chocolaty perfection you get will have everyone asking for more. 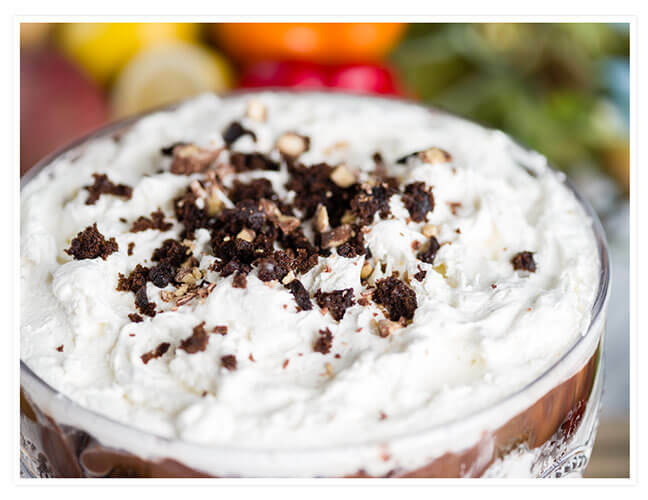 You’ll swear we stole the recipe… it’s that good! Sometimes it’s the sides that are served along the main courses that get our taste buds’ attention. 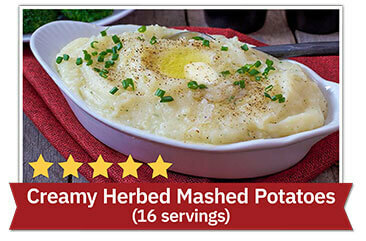 Our Creamy Herbed Mashed Potatoes are one of our favorites – no lumpy spuds here – just smooth and scrumptious ‘taters with a touch of garden-fresh herbs to make them truly special. 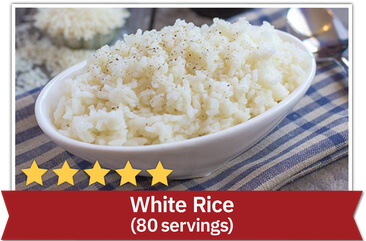 Or how about just good ‘ole White Rice as a companion to your main dish? This surprisingly vitamin-rich and low fat grain is like a culinary blank canvas. Add a pat or two of butter and a dash of salt, and you’ve got a delicious and easy to digest grain that will instantly give your energy (and your outlook) a definitive boost. Sprinkle on some soy sauce or even savory spices to jazz it up! Now you can enjoy the protein-packed goodness of real milk without the hassles of spoilage or need for refrigeration! 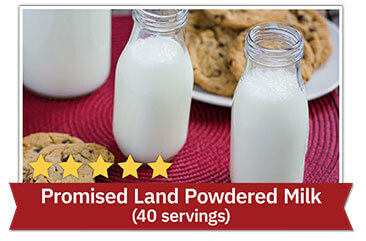 Our Promised Land Powdered Milk has an endless variety of uses you can use both long-term or in a pinch. Enjoy your milk on cold or hot cereal, in your coffee, to make your favorite smoothie, or in recipe calling for real milk. Plus, our milk gives you a solid seven grams of protein per serving! Getting enough protein is vital to your health, especially in a crisis-type situation when your body is under extreme stress. These “building blocks” of your muscles and tissues keeps you strong and hunger at bay. 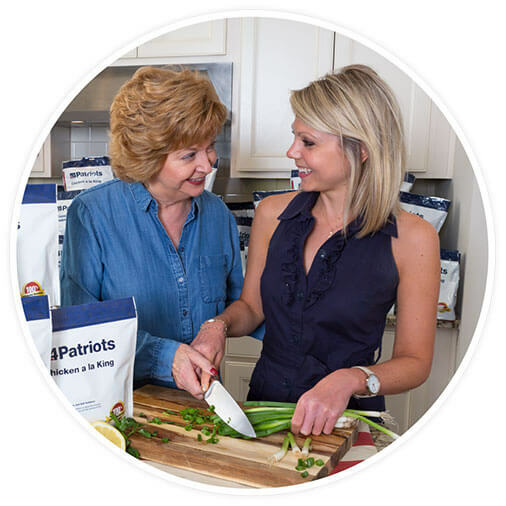 Over the last 3 years, 511,543 customers have trusted 4Patriots survival food. And according to our numbers, 95% are happy with their purchase. Plus, nearly half of our customers come back and order more. Folks are happy with the product – and the numbers show it! “I am a 60-year-old single veteran and a previous Food Service Specialist in the Military. I feel it is very important that we think about our basic needs, be thankful for what we have, get ready, learn and be prepared. 4Patriots Survival Food has really come in handy! It’s so good and has especially come to my rescue during some home emergencies when I couldn't make it to the grocery store. She said it made all the difference to have a hot meal to serve. Talk about a morale boost! Don’t you want to be self-reliant in a crisis… just like Pam and Tom? Well of course you do. And you don’t have to spend a fortune to do it, either. We’d like to help as many people as possible enjoy the peace of mind of a 3-Month Kit on hand. That’s why we’re offering a special price today… and giving you 3 FREE BONUS 72-Hour Kits and FREE Shipping with every order! Since these kits sold out before, we’ll order as many as we can to get ahead of the demand. Tastes so good… You won’t believe you’re eating survival food! It may be months before we can stock up again. There’s only 1 “complaint” that we ever get about the 3-Month Kit. It’s that many of our customers want to pay for it a little at a time, instead of making one larger payment up front. And we can certainly understand that request. Maybe you can, too. So for a limited time, we’re going to do just that. You can pay over time—with no credit check—we know that you’re good for it. And we’ll ship out your entire purchase right away, so that you start eating your delicious food right away if you want to. Nobody should give up their chance to claim a 3-Month Survival Food Kit because they couldn't afford it. And we know most people can’t afford to spend $5,000, $10,000, or $25,000 on a stockpile. Most “long term” food supplies sell for thousands of dollars and won’t last anywhere near 25 years. 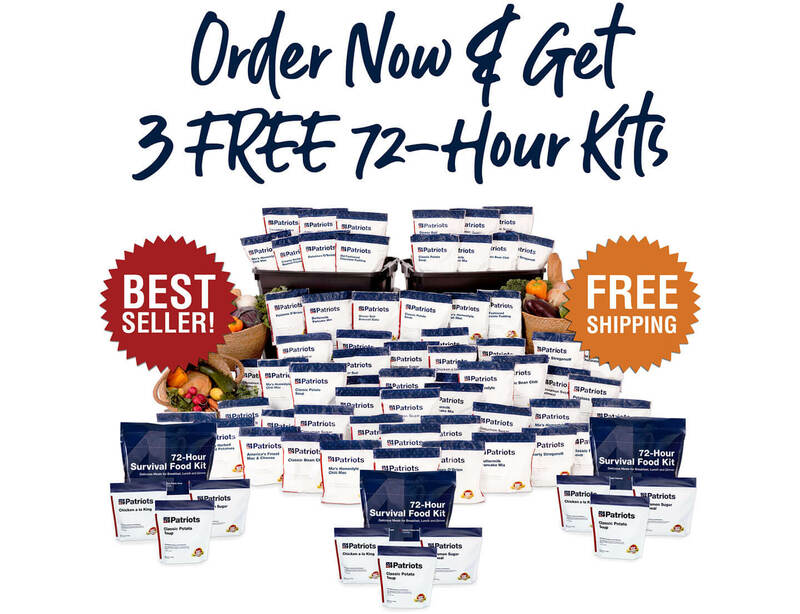 Even our 3-Month Kit – our best-selling kit – normally sells for $804. But we want as many people as possible to be able to get this kit. So you can claim yours for only $99 today – plus 5 easy monthly payments of just $99. That’s 38% off retail! And you’ll get a huge amount of food – 536 servings of mouth-watering, easy-to-make meals – at only $1.02 per serving! No wonder the this kit is our customers’ favorite. Click the “Add to Cart” button below to grab your 3-Month Kit (and all the extra FREE bonuses) now. Add to Cart – $804 Only $497 Today! 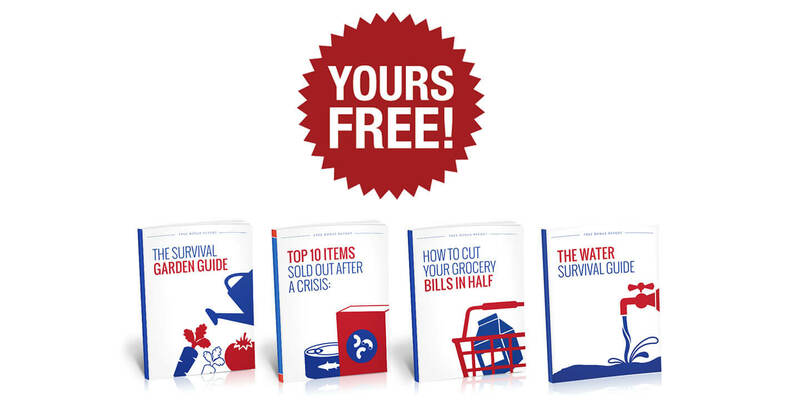 That's exactly what you get—three times over—with your 3 FREE 72-Hour Survival Food Kits today. These kits are normally $27 (each), plus $14.95 shipping (each). But we bought them for you, because you’re taking action today to be more self-reliant with a 3-Month stockpile of your own. And it’s the least we can do for selling out of 3-Month Kits before. We feel terrible about that. Each kit is guaranteed for 25 full years on the shelf, packaged in military quality, re-sealable Mylar packages. So when you pop one open a decade from now, it will still taste just as delicious as the day it was packaged. 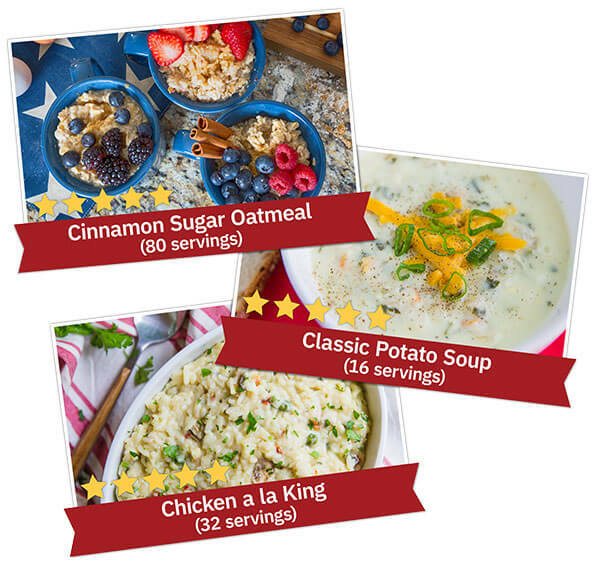 And each of them has 16 servings of tasty meals such as Chicken a la King, Classic Potato Soup and Cinnamon Sugar Oatmeal. So you’ll now have 48 more servings of food – 10,080 more calories! – for you or to share with a friend. “A couple months ago you were giving away Free Food Kits. I was one of the people who received the kits. October 10 we lost everything to Hurricane Michael. 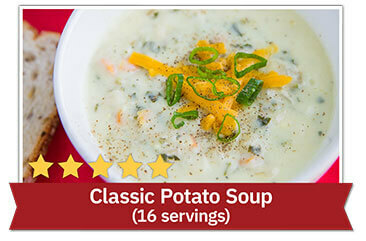 With a small camping stove and a little water I was able to make the potato soup. Funny thing was, that cup of hot soup and some crackers made things not seem so bad. We were alive, together and counting our blessings. “We are 74 years old, and were raised in the country, and still live in the country, and we love your food! We've tried all of the food that comes in the 72-hour kit, and we recommend it! We especially love your oatmeal. It's so easy to make, we don't have to add anything to it, and it makes the house smell beautiful. We ate a lot of oatmeal growing up, and we have to say your oatmeal tastes better than the oatmeal we were raised on! I've been a Prepper for over 20 years, and I've tried it all, and we have to say we LOVE your food, and feel it's a great choice. It's so easy and tastes good too!" The perfect complement to your kit! 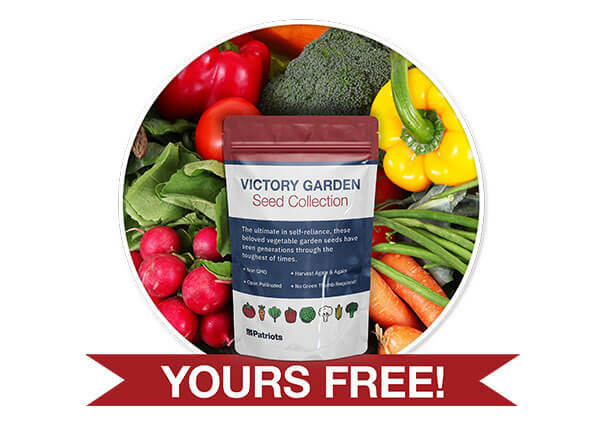 You’ll get survival seeds from 8 varieties of hardy and delicious heirloom seeds passed down from our forefathers. Imagine… you could harvest thousands of pounds of nutrient-dense fresh fruit and vegetables to supplement your survival food stockpile. 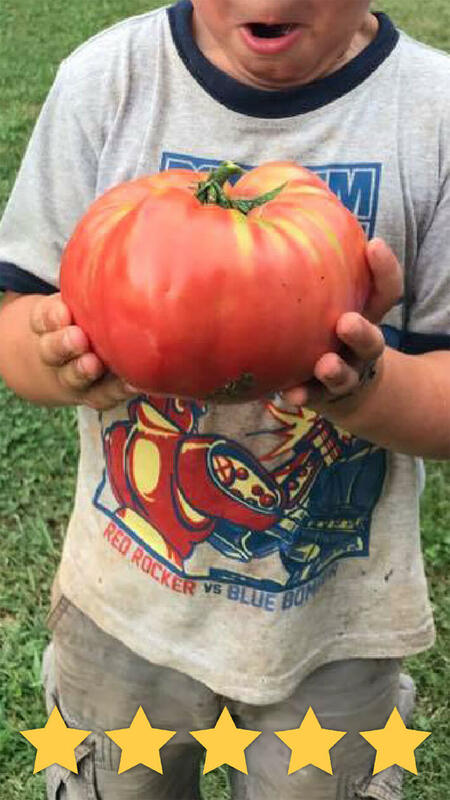 No GMO crap or hybrids here. 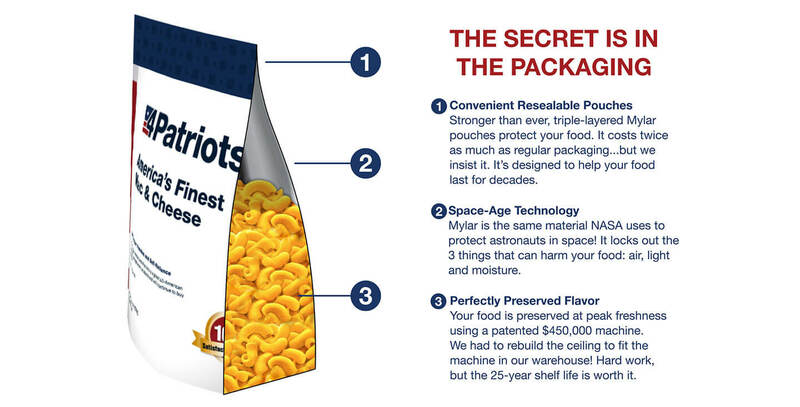 Sealed in sturdy foil packets rated for 5+ years of storage and packaged in a compact mylar pouch. A $67 value, but we since we already bought it for you… it’s yours FREE. And you’ll one FREE with your 3-Month Kit today. “I have used the seeds to start my move back to non-GMO food. I may have started too many tomato plants and planted them too close together, but we are swimming in them now. It is so nice to be able to cut the bud and just use the best of the centers. There are 10 things you MUST have on hand in a crisis. They’re also the FIRST things to leave the shelves. In this hardcopy report, find out how to get them now, not later when it’s too late. In this printed report you’ll get the lowdown on outdoor and indoor gardens, freezing, and long-term storage. Long term planning is a must for supplementing your survival food needs! It's sad to see how much most Americans are forced to spend every time they go to the grocery store. To help out I'm going to give you a third hardcopy report! To show you my down-and-dirty tricks to getting the best deal… and this goes a lot further than clipping coupons! A fourth book – and you’re going to love it. Because the one critical thing you’ll need to complete your survival plan is clean water. This guide shows you how to source, store and collect water in an emergency. 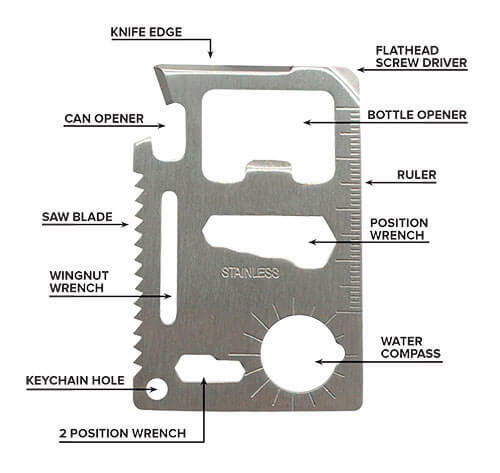 No bigger than a credit card, this tiny powerhouse has a multitude of uses: bottle opener, flathead screwdriver, can opener, saw, and more! 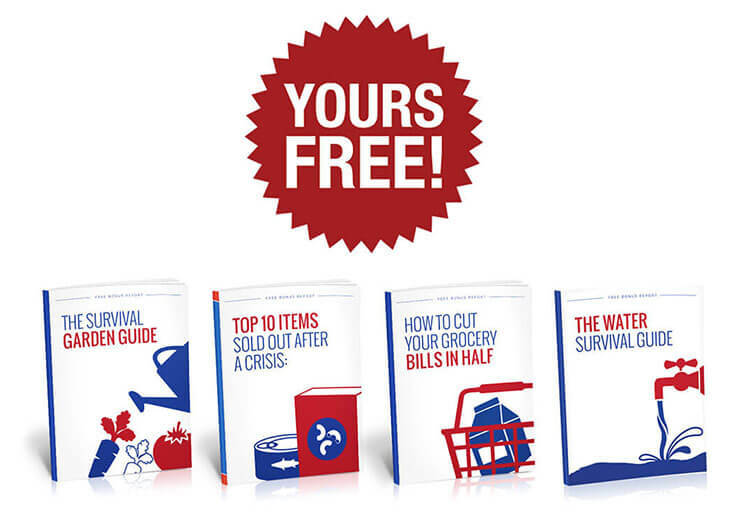 Last but not least, you’ll get FREE shipping on your 3-Month Survival Food Kit today. It’s not cheap to ship 536 servings of food in two totes (plus all the FREE gifts I’m going to throw in). But you deserve it for becoming a loyal customer. And frankly, I want to do it for you. Just click the orange “Add to Cart” button now, and we’ll add the 3-Month Kit and all the bonuses to your order right away. You’ll get a 100% money-back guarantee for 365 days with no questions asked. 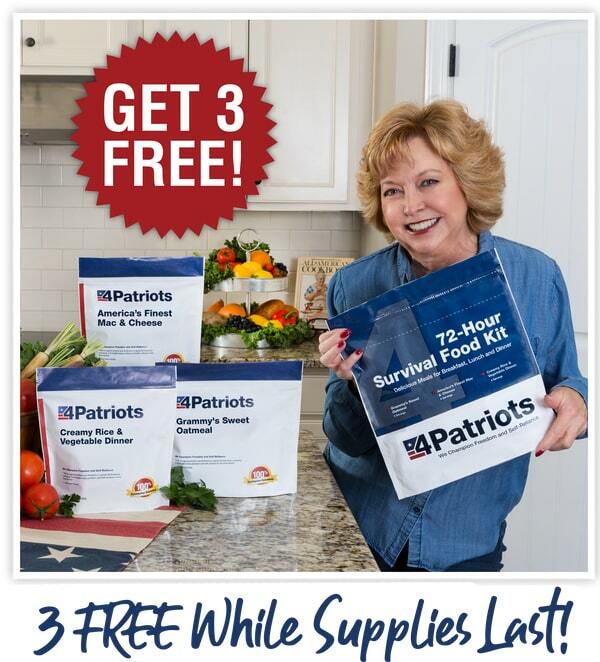 If for any reason you're not satisfied with your 4Patriots 3-Month Survival Food Kit, just return it within 365 days (that’s a full year) of purchase and we'll refund 100% of your purchase price. No questions asked. That way there's absolutely no risk for you. And you can keep the FREE gifts for giving your survival food a try. 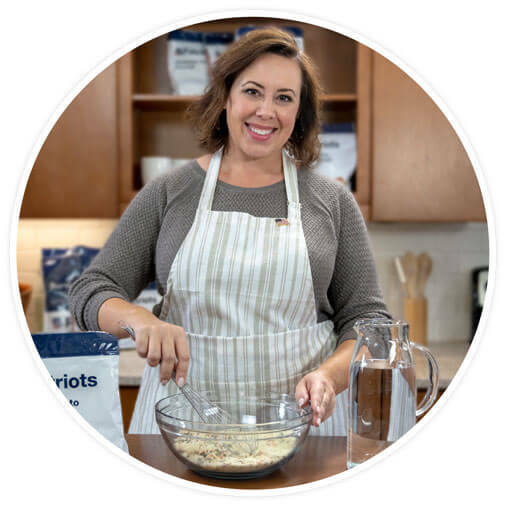 If you open your 4Patriots meals anytime in the next 25 years and find your food has spoiled or gone bad, you can return your entire 4Patriots stockpile and I will triple your money back! Does that sound fair to you? That's how confident I am that this food will remain just as delicious and nutritious for the next 25 years as it is on the day you buy it. 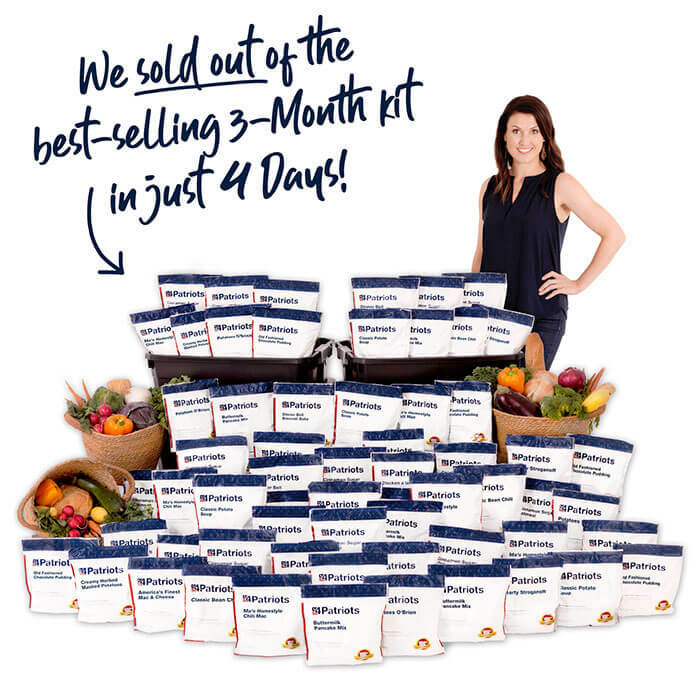 As you can clearly see, the 3-Month Survival Food Kit is an incredible value! “Today we received our 3-month supply of emergency food. 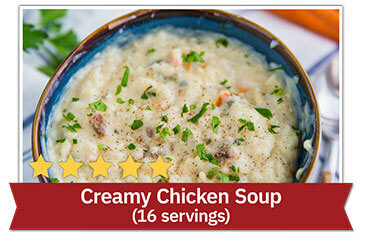 My wife and I decided to try out the Creamy Chicken Soup today for lunch. We carefully opened it and poured it into a pan. We cooked it up and DANG! IT WAS AWESOME! She was quite impressed, to say the least! “I started thinking about putting together my hurricane box. I did my research. I found out that some of the food products out there go bad pretty quickly. And in a hurricane, if your food supply goes bad, you can’t run down to the 7-Eleven… because there is no 7-Eleven. You’re gonna have to eat somehow. “My husband and I are more than pleased with the food ordered from your Company. We tried a couple just to see if we wanted to order more. You are right. They are absolutely delicious. Last winter we had a terrible ice storm. We were totally blocked in for several days. We had our emergency pantry and it was a godsend. We own a small house next door that has a wood burner stove. We and the two dogs moved over there for the duration. I was able to heat food on the wood burner and use lights that we bought for emergencies. The fact that your shelf life is so long sold me on your food. I figured it would be like the old C-rations, but not so. The food is delicious. I am pleased with the taste and texture. I would recommend your food and services to anyone. “I always stockpiled food for emergencies, and other items... But I have thrown away so much food because it’s expired and I haven’t been able to get to it. When this came along I thought, a 25-year lifespan?! Wow! “The life expectancy of your product is what attracted me. Now that my first order has arrived, I like the fact that the package, once I moved the label to the inside of the lid, doesn’t scream ‘food storage’ to unwelcome or prying eyes. I had been concerned about stocking up with foodstuffs that wouldn’t last more than two to four years. This cuts down on bulk greatly, too. “I've done a whole lot of research. Why 4Patriots? Highly recommended and well-reviewed with an impressive shelf life and competitive prices. Here's the truth. There truly are several reasons you want to have back up food, water and supplies. When something happens you may very well be on your own for at least three days. Then local authorities will be addressing critical issues only. Then 4-6 days after that, the state help arrives. Then 5-7 days federal assistance arrives. Those in dire need will be helped first. 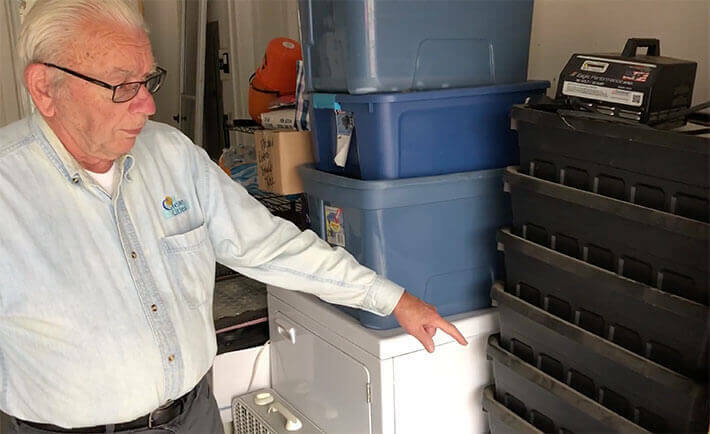 “I recently purchased the 3-Month Supply, which came with the free 72-hour supply. I've tried each variety and can say, unequivocally, that they taste excellent, are simple to prepare, come in an easy storage tote and I have no doubt will last upwards of 25 years as claimed. Can you picture how good this security and independence will feel? When you claim your 4Patriots Survival Food Kit today, we’ll donate a portion of the proceeds to charities that support our veterans and their families. Including Operation Homefront, Fisher House and A Soldier’s Child Foundation. This isn’t lip service, either. We’ve donated more than $90,000 since we founded the company back in 2008. Wow! 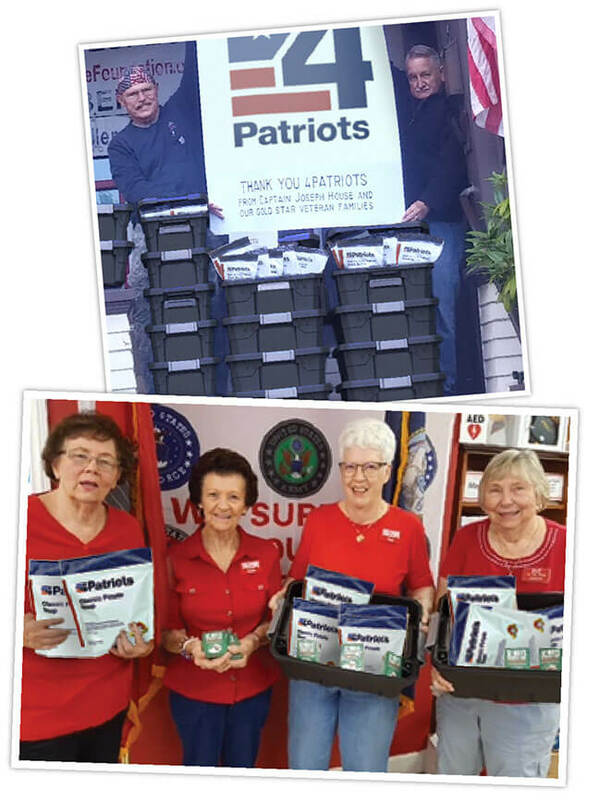 You can feel good knowing that you’re supporting our veterans while getting the peace of mind that comes from having a survival food stockpile. Our office is located in Nashville, Tennessee. Here’s a recent snapshot we took at the office here in Nashville so you can see we’re real people – Americans! Not some 800 number being routed to some foreign call center. With us, you’ll only be dealing with Shane, Chris, Amanda, Cindy and other good folks right here in the USA. People who own and have eaten 4Patriots Survival Food themselves and know the product inside out. We celebrated getting 13 million meals into the hands of American families. Now don't worry, there's no pressure to claim your kit. In fact, if you don't want it, you can step aside. No hard feelings. There are plenty of other people who are dead set on preparing right now and they see the need to act fast, before these kits sell out. If you're ready to take charge and look out for yourself and your family, then click on the button below. You'll be glad you did. This is about peace of mind, knowing that you’re protected in man-made or natural disasters. To get your premium kit rushed to you at this special price, plus your 3 FREE BONUS 72-Hour Kits and all your other FREE bonus gifts… click the big button below. Your food supply arrives in plain and unmarked packaging. Not even the deliveryman will know what you're getting. As of today, inventory is still available. When you order you will instantly receive an order confirmation. We will rush your order to you and you’ll get a shipment tracking number as well. You can get started risk free because you’re backed by a 100% money-back guarantee for 365 days. It’s like trying it before you buy it. Click the button below. You'll be glad you did. Remember, this is delicious food good for 25 years of storage. So even if you don’t need your food stockpile… just eat it! 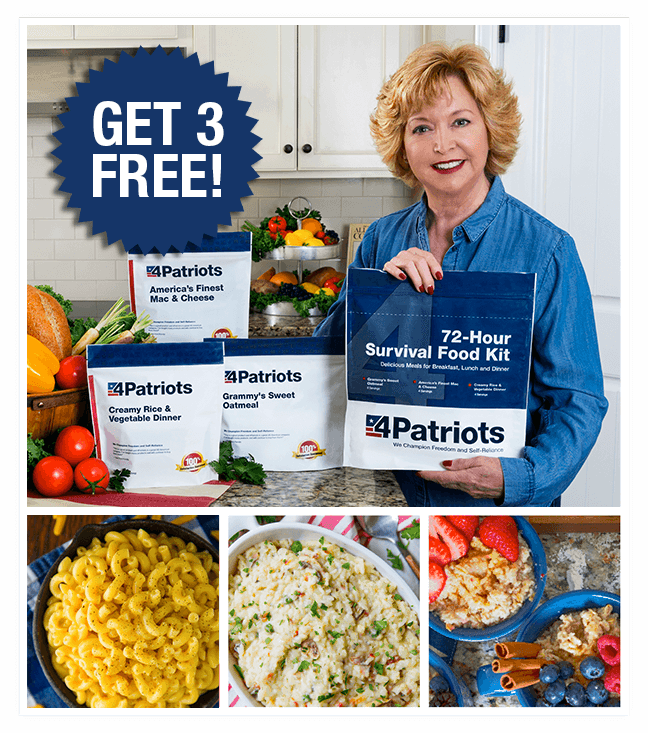 Claim your 4Patriots 3-Month Survival Food Kit and your FREE gifts now. Click the “Start My Order” button below. “My favorite recipes are the pancakes and the cinnamon oatmeal, just like grandmother used to make. 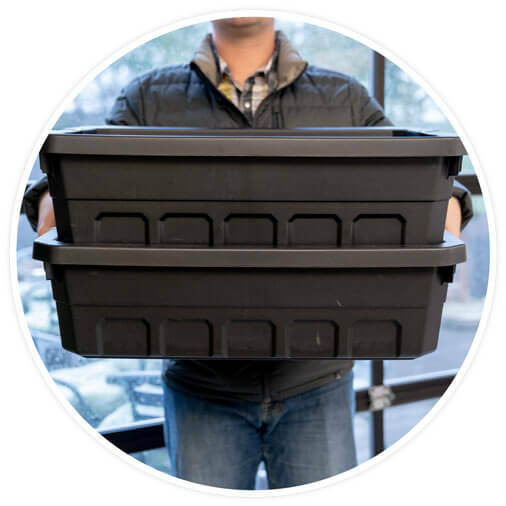 The storage bins are a wonderful plus for easy storage and multiple uses. “I received my 3-Month Kit and was impressed with the packaging and the timely arrival. I cooked up some of the food because I had to make sure it was acceptable as a food source! I needed to know I would enjoy eating this during any type of crisis. “I saw 4Patriots Survival Food on TV and decided to order it. When I received it in the mail I looked it over. To my surprise, I saw that your packages are resealable. Other companies’ packages were not! The next day I tried your Cinnamon Sugar Oatmeal. I thought I had found the holy grail of oatmeal! It blew away the other company’s oatmeal. 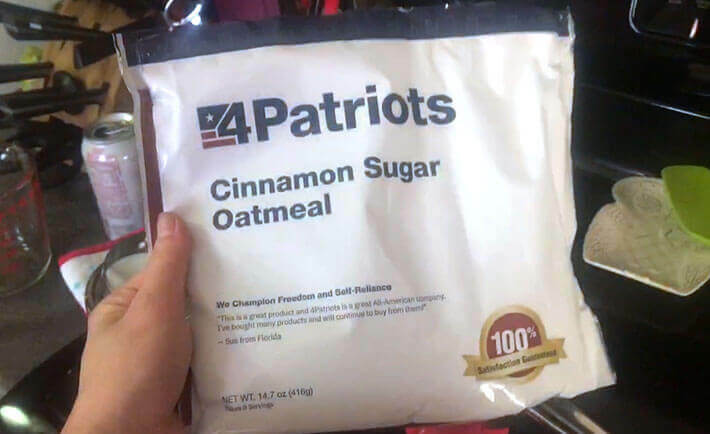 To do a taste test, I cooked the oatmeal from the other company and at the same time, I cooked up the 4Patriots Oatmeal. I then went next door and let 10 of my very closest friends taste test both of the oatmeal brands. There wasn't one person who didn't like yours better. 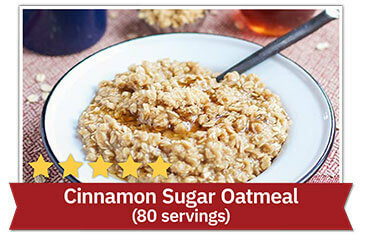 Everyone claimed that “Cinnamon Sugar Oatmeal” was the best oatmeal they had ever tried. Now they all want to purchase your food! American Red Cross. “What Do You Need In A Survival Kit?” 2018. Bloomberg, Bjerga, A. “Food Stamps Still Feed One in Seven Americans Despite Recovery.” 2016. Wall Street Journal, Smith, R. “How America Could Go Dark.” 2016. Pry. Fox News. “What threats face America’s electrical grid?” 2018. Fernandez. New York Times. “Still Waiting for FEMA in Texas and Florida After Hurricanes.” 2017. Mazzei. New York Times. “FEMA Contract Called for 30 Million Meals for Puerto Ricans. 50,000 Were Delivered.” 2017. Long. The Washington Post. “The U.S. doesn’t have enough truckers, and it’s starting to cause prices of about everything to rise.” 2018. Schaefer. National Review. “Reforming U.S. Food Aid Can Feed Millions More at the Same Cost.” 2018. The Guardian. “Is help finally at hand for suicide crisis on America’s farms?” 2018. Picchi. CBS News. “Why hunger is still a problem in America.” 2018. Christensen. The Guardian. “Food apartheid: the root of the problem with America's groceries.” 2018. Atkin. The New Republic. “America Is Not Ready for This (Again).” 2018. Reuters. FEMA contractor did not deliver millions of Puerto Rico meals: lawmakers.” 2018. 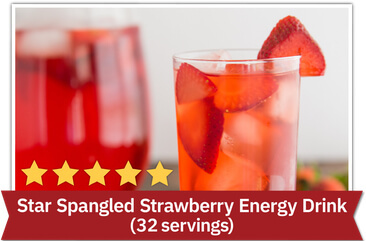 LEGAL DISCLAIMER: The information on this website has not been evaluated by the FDA. Our kits are intended to provide you with energy and nutrients during stressful emergency situations. They are not intended to be complete caloric replacements during “normal” times. Caloric needs vary based on age, gender and activity level. All testimonials in this advertisement are from real people; sometimes name and picture has been changed to protect their privacy and some were given free products in exchange for their honest feedback. Testimonials represent exceptional results, don't apply to the average purchaser and are not intended to guarantee that any one will achieve the same results. The organizations, publications and people referenced on this site are not affiliated with and have not endorsed, sponsored or recommended this product. Copyright © 2019 Food4Patriots® — All rights reserved.